Education is a valued process of growth and development in pivotal years of one’s life, yet it is not always accessible. As a new school year begins, many are unable to afford the costs of learning. However, a Texas Baptist Hunger Offering ministry in Hidalgo County unites the educated and the uneducated in their community by service and sacrifice to assist the literacy needs of refugees and immigrants. The U.S. Census Bureau found that Hidalgo County has one of the highest concentrated poverty rates in the country. High population rates, coupled with high poverty rates, have created a need for educational support as the uneducated, illiterate, and non-English speaking Latino and refugee populations cannot afford educational resources or classes. "I've seen God at work in an entire community because of this ministry," said Diann Berry, ministry leader. “And by community, I mean various communities throughout the entire Rio Grande Valley region." 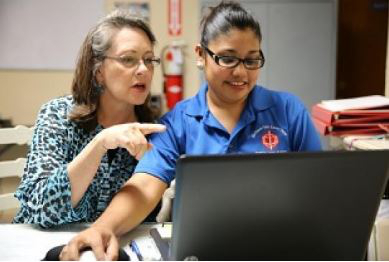 The Rio Grande Valley Literacy Center offers all levels of ESL (English as a Second Language) and GED (General Education Development) test preparation classes, in both English and Spanish, serving up to 250 students in a semester. "Some of our students have worked hard to study, to gain some knowledge, to become more employable, and do something about the cycle of poverty they are caught up in," Diann said. The ministry encourages community collaboration by bringing the privileged, educated community together with their uneducated neighbors who live in the colonias, which are neighborhood pockets of rural poverty. The former volunteer their time to teach ESL and GED classes. Diann prays publicly at events, which helps the participants recognize the ministry's ultimate focus -- honoring God by loving your neighbor. The Literacy Center is one of many ministries the Hunger Offering is able to assist through funding. To participate in this work, give here.